Soooo annoying. The background looks light blue on my left monitor and pure white on my right monitor. And the striped line is totally straight on the LAYOUT but damn if it doesn’t look totally wonky in the photo. 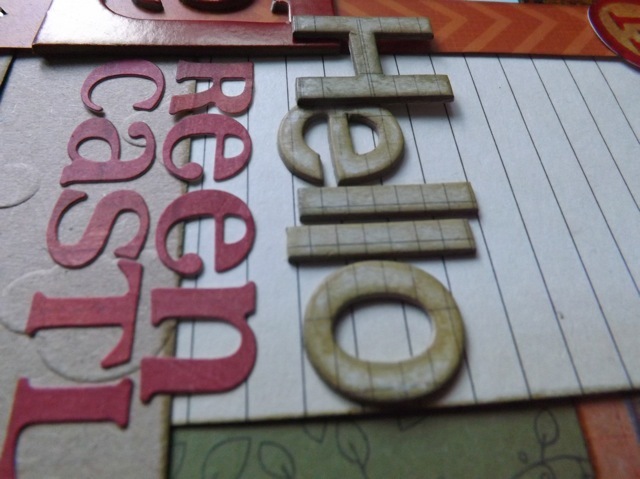 And the striped texture of the cardstock is totally lost. 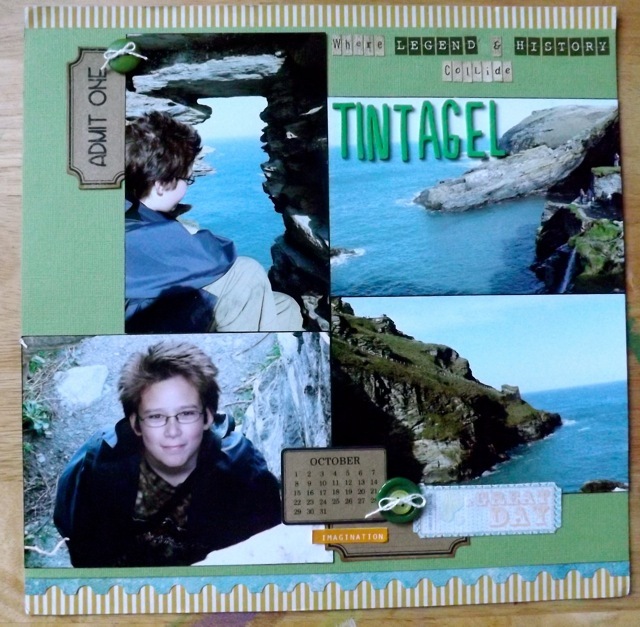 Oh well – it was just a bit of fun, and after so long it’s was just to remind me how much I love scrapbooking. Look back to yesterday to see the download. And happy scrapping! 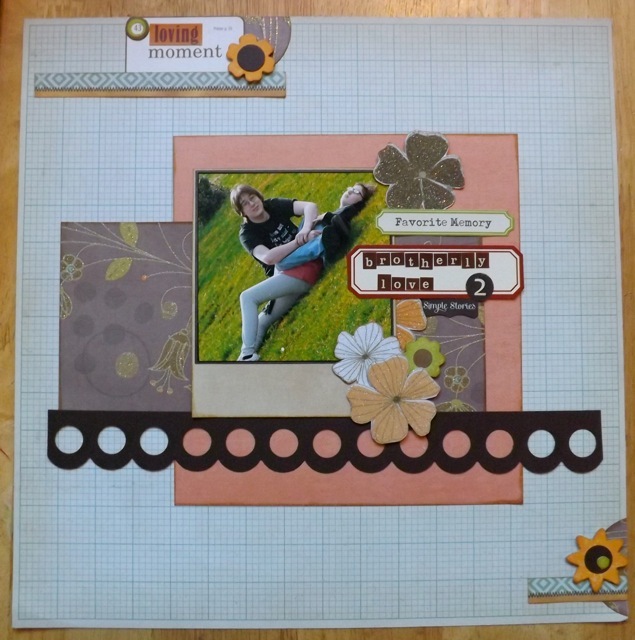 Categories: Layouts | Tags: Layouts, scrapbooking | Permalink. I did say I wanted to try it so I did. I wanted to see how the flexagon structure would work for a mini-book. I think it worked, but the inherent problems with it made me think of another use. Start with creating the flexagon as I mentioned in the post here. 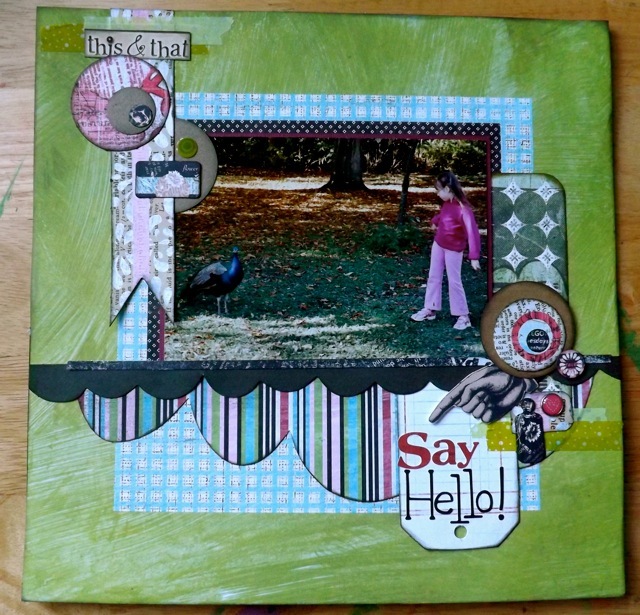 I opted to make it as close to 12 x 12, with the idea that the photos wouldn’t be skimpy, even in the fairly small areas. I made another on using the only large format paper I had on hand, which was vellum/tracing paper. 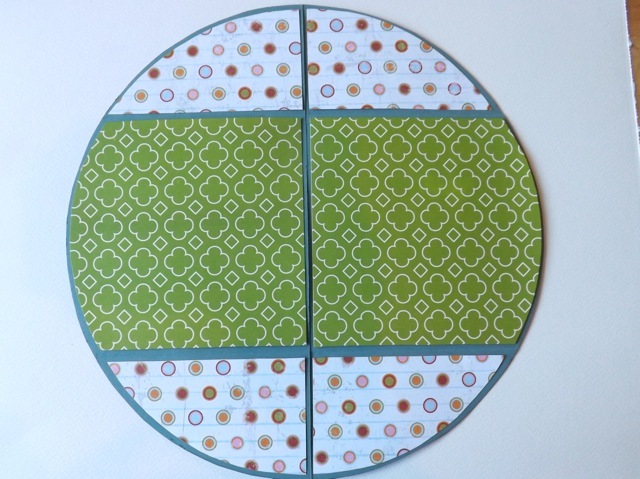 I stuck the circles to create the structure with repositionable adhesive, so I could see where the folds were. 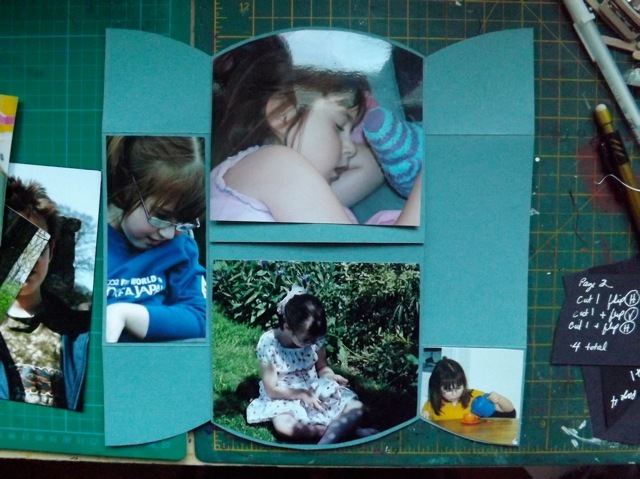 My plan was to make templates to use when cutting the actual photos and/or decorative papers to add. 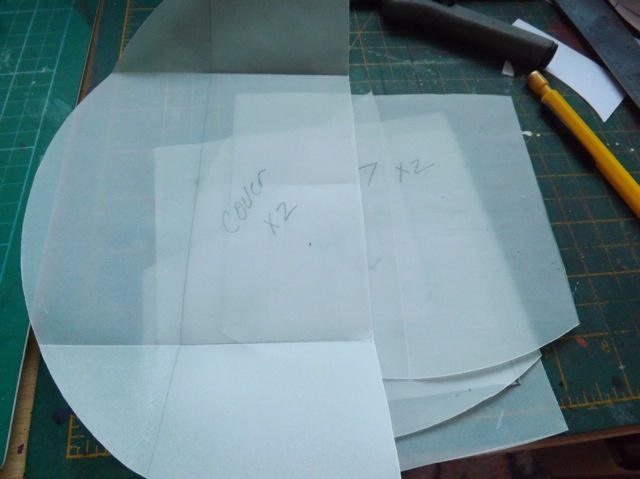 That allowed me to note the various shapes and cut apart the sample to create templates. Once I had folded t, it opened each section and noted the direction of the photo and how many of each section, with what orientation and number I needed. Problem One: With the best will in the world, and as much attention to detail as you can muster, getting ever fold absolutely precise, the EXACT same size, is impossible if you aren’t a programmed machine. Creasing to the left of a line one time and to the right of it another is going to have the cumulative effect of things being “out” when all those tiny differences are added up. Accept it. 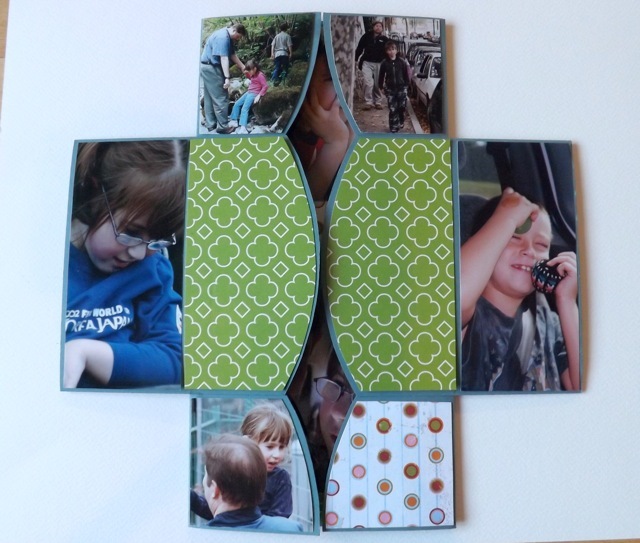 I had the idea to do something I’ve always done when using odd-shaped templates for photos, which is to cut them from black card, scan them, take them and the photos into PSE and use the shapes as a mask – that way I print only the area of a photo I need. I started down that route but had the niggling suspicion that I wasn’t going to be entirely happy with the project in the end, so went instead to a stockpile of old printed photos, with the idea I would make one and see how I felt about it in the end, while not spending a huge amount of time on it. 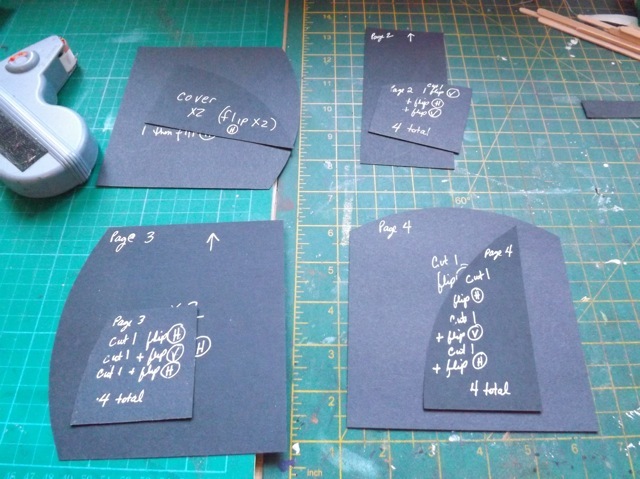 Where I discovered the cumulative effects of so many folds was when I tried to match the templates to the actual piece. They fit fairly well, but I noticed that, for example, with the cover, the small shape at the top is actually repeated 4 times, the large shape twice. BUT the top two small shapes were every so slightly smaller than the bottom two. It was the same in every case, where a shape LOOKED the same, but it was slightly different. 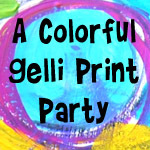 I just resolved not to worry about it if they were not perfectly matted, but still checked each template according to which photo I was cutting, and adjusted on the fly. Problem Two: There are a couple of areas that you will see either in two different flips OR thru a gap to another page. Not a PROBLEM, per se, but it’s worth checking to make sure those repeated photos work with both pages. Problem Three – The photos in some areas are really big. The middle two, top and bottom above, are 5 x 7 prints and they are too short to fill the area. 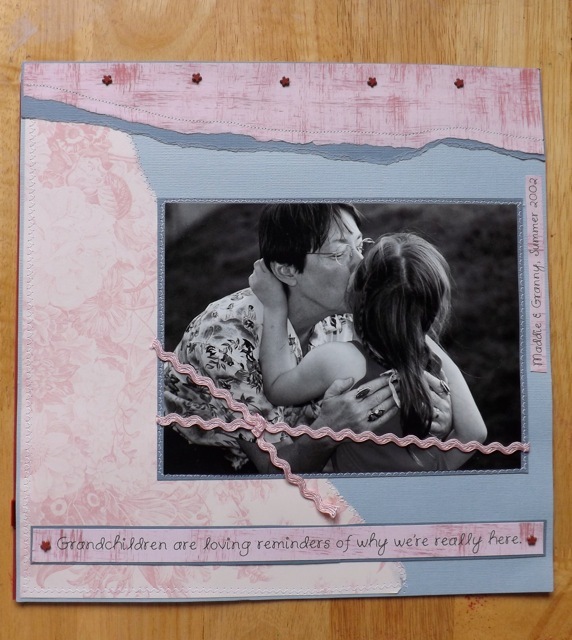 You can work around that by leaving the background on show, like here, OR by covering that area with decorative paper or an embellishment or journaling OR you can cut two photos smaller to fill the page OR cut many smaller photos. MY aim was to have the biggest photos I could for each section. You’ll see how I dealt with it at the end. And that leads nicely on the PROBLEM FOUR, which is, I think the biggest one (no pun intended) – it’s so darn BIG! a 12 x 12 “mini-book” is no mini! Where would you put it? How would you display it? – especially given there is no way to have a cover that protects it because that would totally interfere with the flip action! 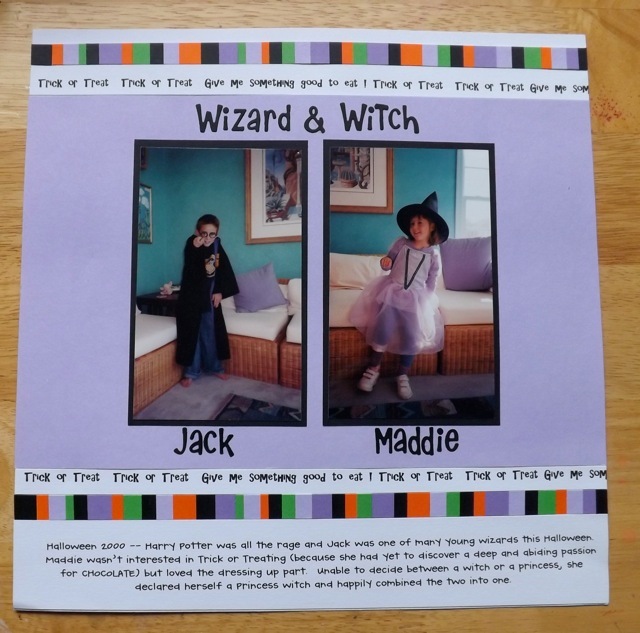 and unless you only want there to be two flips, leaving the front AND the back as “covers” of only decorative paper, there will be photos on the back page, the final flip before returning to the front cover, exposed. 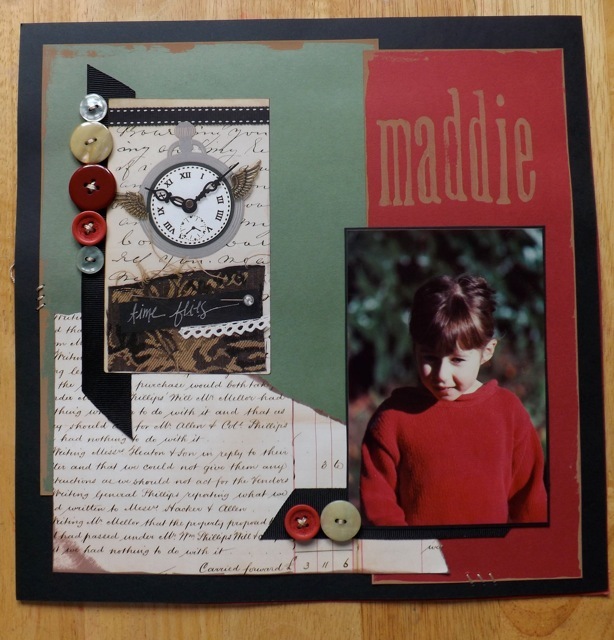 Let me show you the un-decorated version – I’ll add some flat decorative items, some journaling blocks, etc, to finish it off – and then talk about how I think it COULD be used. 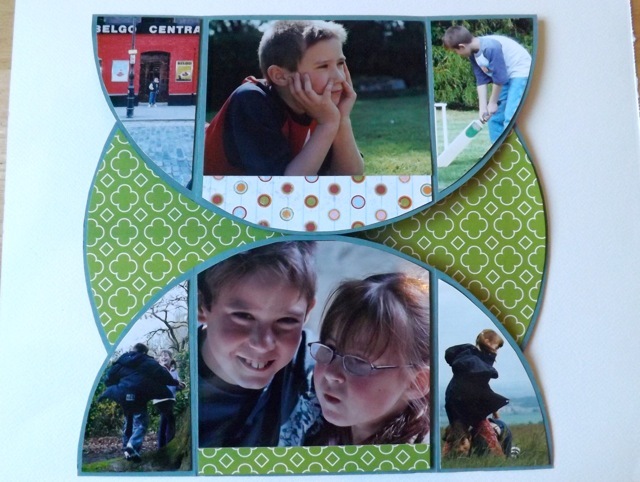 Note those two side photos – here they are again in flip two! Also note you can see thru to the last page – I tried to get faces in those areas by careful photo cutting with some success, but it may not matter too much. Just be aware. And the final flip before returning to the cover – this would be the BACK cover if you left it as decorative paper, which is a waste of good photo space! Note too you can see the green bits from the front cover. You may think they could be the green curves from the previous page, but they aren’t. That may inform your title placement. unless you want sideways words appearing here. Right. So while I so love the flipping action of this how do I make it more usable or do I give up on it? 1. I DO think it works in this large size as a LAYOUT. The hint was in the title of this blog post LOL! So, decorate the cover, add the journaling, and slip the whole thing into a page protector in your album just as if it were a round layout. Where might it work? 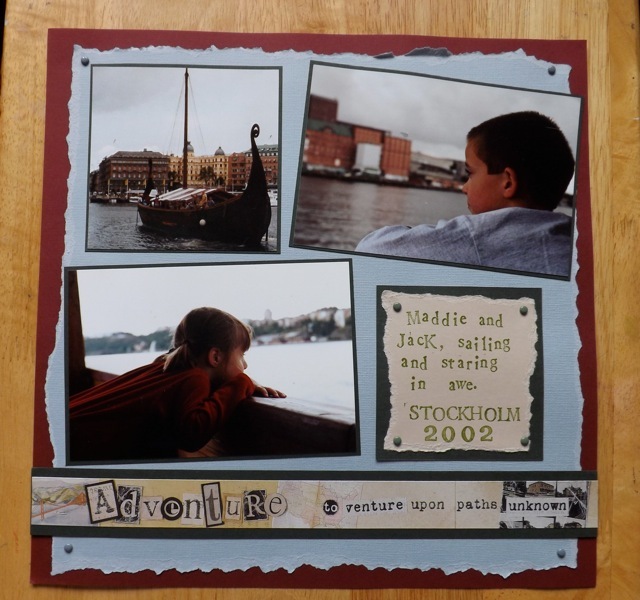 any memorable moment with lots of photos but I think it would be fab as maybe a Baby’s First Year, where the flipping action could highlight the changes in a baby. it might also work for maybe school photos? 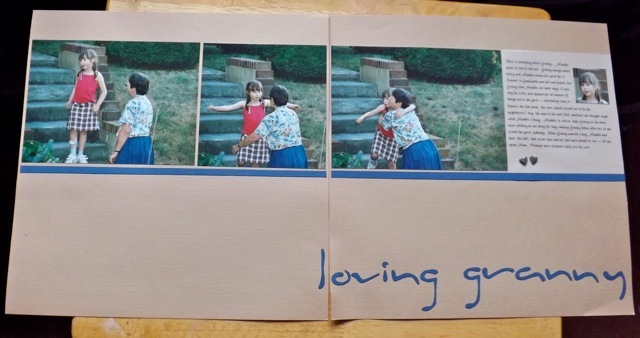 If you, for example, did the repeating photos as 1st grade and 6th grade (or nursery and year 6) that could be cute. 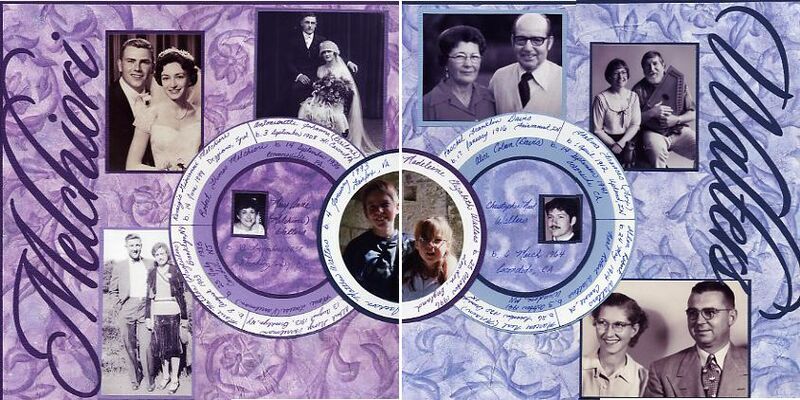 any sort of THEN and NOW layout – dating photos, ending with a wedding? documenting a weight loss or makeover or haircuts over the years? Any of those things COULD work for a layout topic. 2. 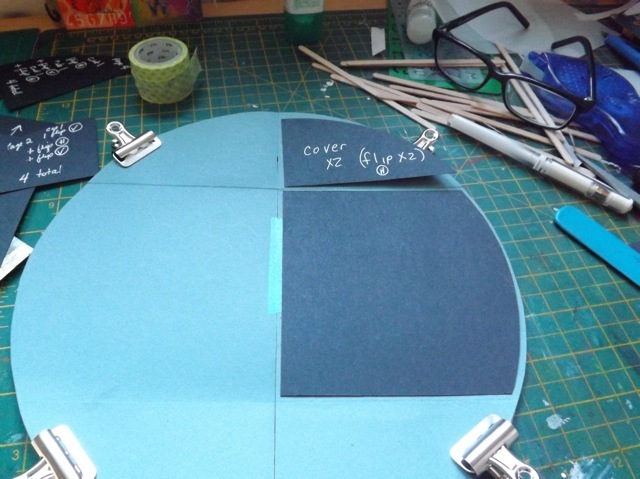 Make it smaller as a mini-book (I’m thinking 8 inch circles to start) and use photos only in the biggest spaces, saving the smaller ones for journaling. 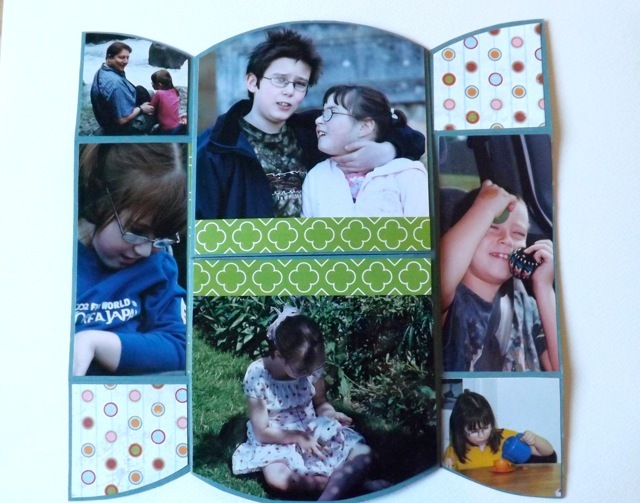 Present it in a large custom box or envelope. 3. Make is smaller still (6 inch circles like the Steins;Gate doodah for DS) and present it with photos only in the middle two flips, leaving the front and back as decorative, and present it more as a CARD, for a really special person on a really special occasion. So that draws a line under this particular experiment. It was fun, working it out, I’m calling mine a LAYOUT and will put it in an album. The photos are a bit random, but I would call it Out and About, or something like that as all the photos are from days out, or at the very least out in the garden. That works for me. If you find a use for this that I haven’t thought of, do share. I still think it makes a cute card, but I really like the interactive nature of it with the photos. But I’ve satisfied my curiosity so I can move on…. 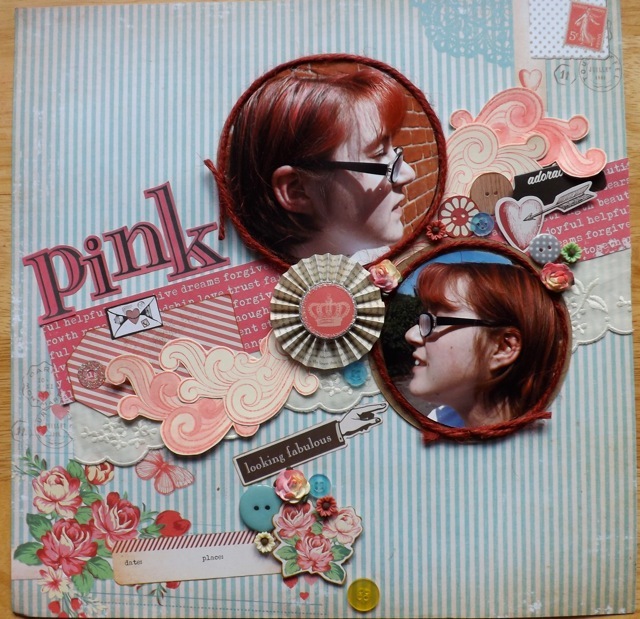 Categories: Layouts, mini-albums, scrap related | Tags: how-to, Layouts, mini-albums, templates | Permalink. This must be a record, at least for recent years. I’ve managed to make a total of 6 layouts in the two crops I got to this month. Woo hoo. Perhaps more shocking is the fact I also managed to use, at least for these two, CURRENT photos, rather than ones from when the kids were little. First, yo may recall me mentioning DH and his constant chili-cookoffs over the summer. That would have been the prime reason I missed a few of the crops. Here is the layout. I thought about doing this as a two-page spread, but in the end I felt it worked fine with 4 photos on one page. I went all the way back to that Wordfetti – still love it. Oops. I forgot to re-stick the dot over the first i. And I will ALWAYS spell CHILI in the American way – despite the fact my Mac, set to UK English will insist on asking me to “correct” it to CHILLI. Bah! 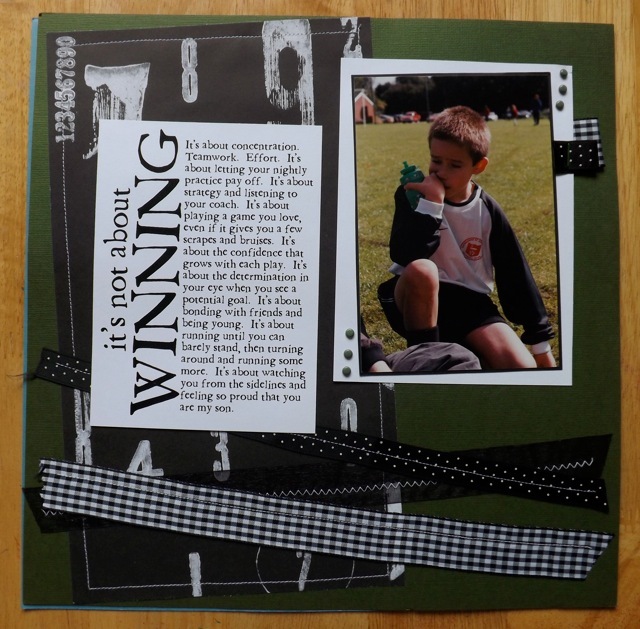 The next one uses Louise’s fab school printables from the UKS Blog Hop. I printed them and spent a week pushing them and the tiny polaroid-style photos from the Fuji camera DH brought back from Japan around on the basic background. Finally settled on the arrangement here. 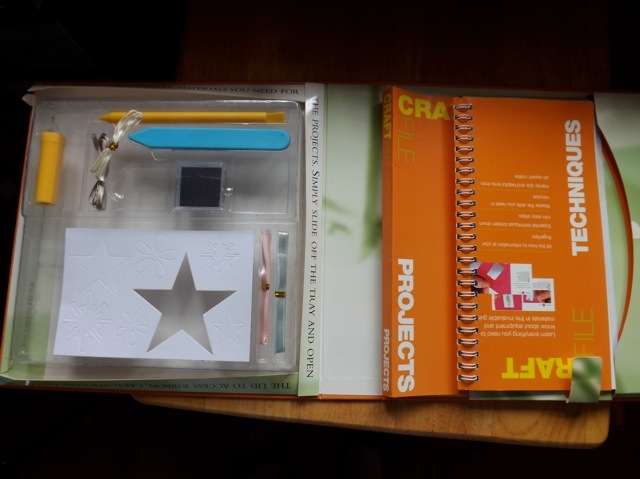 Both seem to use the little file folders, decorated on the front, which flip open to reveal journaling. The Chili one, the back half is stuck UNDER the blue paper (I’ll photo the trophy, print it small, and add that to the surface of the big photo, then journal to the right, on the reverse of the flap, while on the bottom layout the back of the folder is stuck to the background and just opens, leaving me more room for my thoughts. A bit annoyed because for months now iPhoto will NOT open a photo to be edited in PSE. Well, it WILL, but only in the older PS 6, not 10. I’ve changed it in the preferences, so it SHOULD work, but all it does is open PSE 10 but refuses to open the photo. Grrr. The reason I am annoyed by this is that there was a discussion on UKS about photographing layouts, with a nifty little trick for getting them square and in perspective. Wanted to try it, couldn’t, so I just took the photo and slightly cropped it. Lucky I’m tall so even the top one , which I couldn’t crop as easily as the bottom one, looks OK just by using the iPhoto tool. But still…I need to hunt up an answer. Likely as not I will have to uninstall iPhoto (or PSE) and re-install it, or something stupid like that. 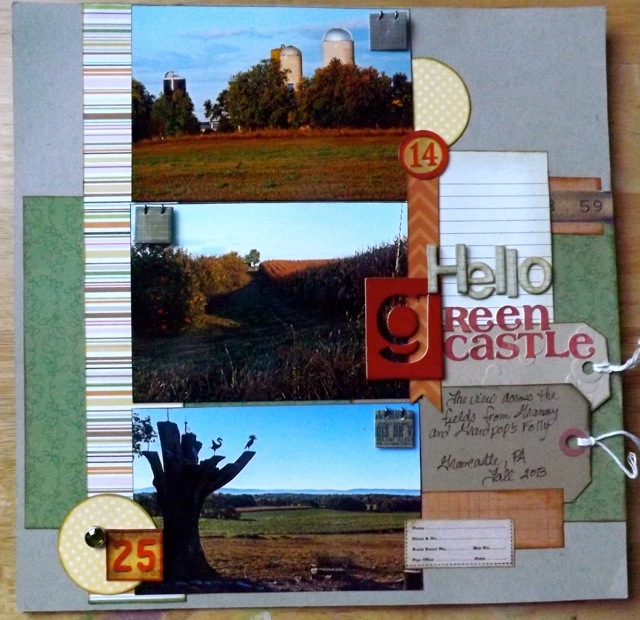 Although it took me quite a while to get my scrapbooking hat on straight, I managed to set aside four kits for my crop yesterday. I finished all four of them, with minutes to spare. Pretty happy with them all – less so with the photography of them. The light really doesn’t come in my window till afternoon, and I have a lot going on today so I didn’t want to wait. This one is a box of pumpkins – rubbish handwriting but I am still pushing n with using my own. It just isn’t getting any better… I still love Mr. Campy papers. This one is one I started at the LAST crop but I wasn’t sure where I was going with it. Fresh eyes a few months later and I finished it. So annoyed with the sticky foam letters. They stick SO completely to the surface of the photo and they just are impossible to add perfectly straight on the first contact. 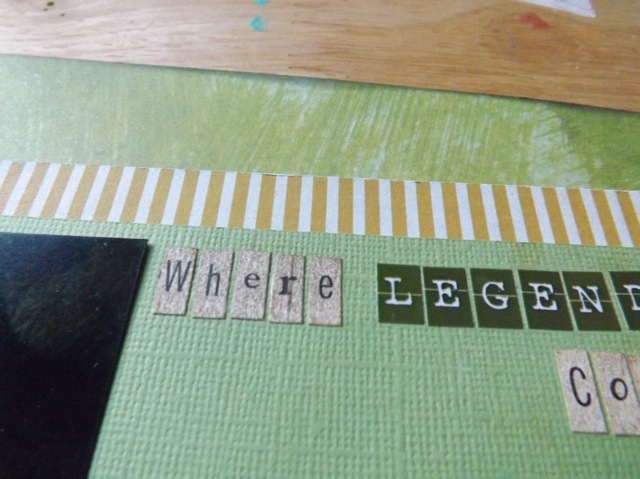 I am considering adding fresh letters to a scrap and putting it over the wobbly letters. I THINK the photos are digital but I’d have to peel them back to see if there is the developers mark on the back or not. If they are I might just print another one and pick different letters. Grr. This uses a Basic Grey kit I picked up at some point. Always liked it but DD is pretty much grown out of pink, so I had to go back to some old photos to make use of it. Funny, but the THIS & That scrap and the pointing finger are both from packaging. The finger is from the masks/stencils I bought so I have a few of them. 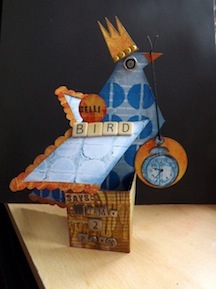 And even managed a bit of Washi tape on that one. Finally, a few shots over the fields from the In-laws house. Just realized I used HELLO in the title of those last two. Arranging the title on the last one was tricky, but by overlapping the letters and adding a foam square under the floating bit it worked out pretty well. I actually had two other kits sorted but forgot to put them in my bag. That means I have a head start on the crop NEXT weekend! Now, I have some Christmas printables I am working on that I really need to finalize and a few other projects to work on as well. Sunny day so the laundry calls, and a gazillion other things. Happy Sunday! Well, I am still indecisive about adding journaling to this but I thought I would go ahead and post it as it sits so far. DD and her pink hair – although it looks more read than it does in real life. And because she has to use anti-dandruff shampoo, at the moment it has degraded into blond highlights. Now she is off on to hair extensions! OMG are they EXPENSIVE. Not willing to spend upwards of £20 for something that is just a lark, to be honest. I bought those Colorbok letter stickers (actually about 3 or 4 packs of various ones) eons ago on a trip back to the States and I have gotten SO MUCH use out of them. Love this font in particular. Not sure what is the plan for today. The kids home, DH back from chili cooking (he got 2nd place!) and DS being home forcing way more grocery shopping than I am used to is all taking its toll on my free time. 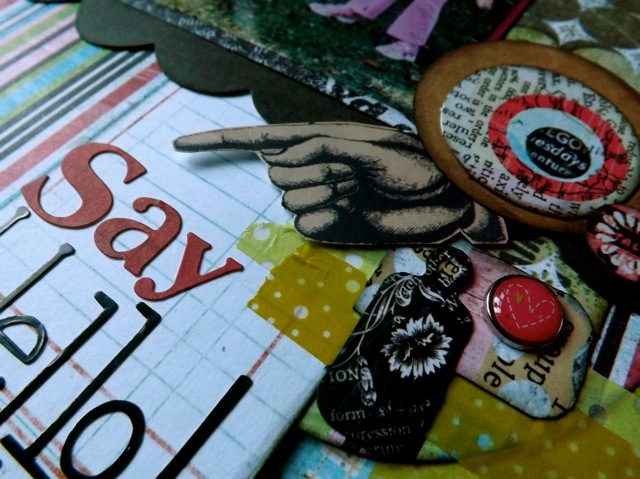 We shall see what I can manage – maybe working on the odd little mini-book from last week, maybe something for the SDC challenge, maybe something Gelli, maybe quilting. I just don’t know! 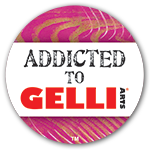 And if you are a UKS member, do pop in to the Gallery there to vote for your We Challenge You favourite. 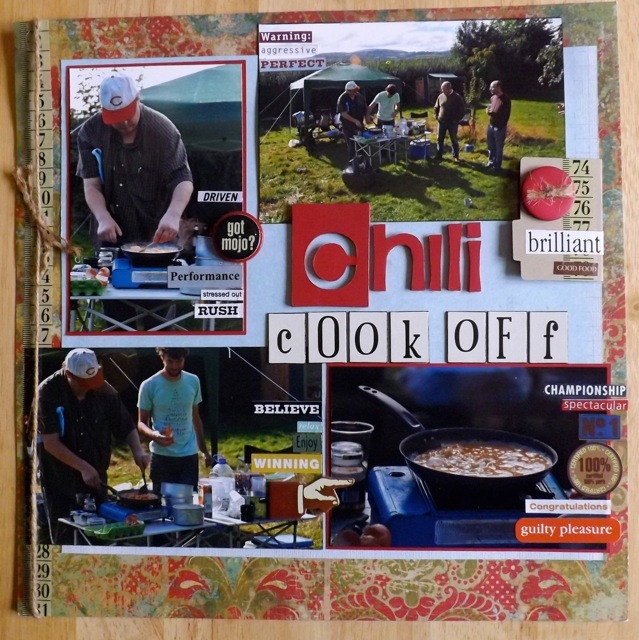 There are some fab layouts, all produced from UKS challenges of 2013. If you are indecisive like me about what to do with a small block of time, it might help jump-start your mojo! I am not sure I will get to my BIG CARD today, as I am trying to sort out my passport application, arranging a haircut and photos for me and DD, and getting ready for a long day at the Embassy later in the week. DH is a bit of a worrier, so he decided we needed to fill out both of the possible forms we think we need (although it seems clear to me that only one of them is required) and the one that I think ISN’T required asks for information about my parents. I know, off the top of my head, the standard stuff, like middle names, birth dates, etc. but the LOCATION of their birth was not something I could easily recall. I knew the STATE but not the town. I knew my father was born at home, but where HOME was, I just wasn’t sure. Where would I have that info, I thought, without having to call my parents to get it? Especially since they called the other day and they were on the way to LBI to assess the storm damage to the houses, and power, phone lines, etc. were not guaranteed. Why, on a family tree layout, of course! And sure enough, there is was in my album with all the info included. Woo Hoo! The circular family tree info charts where from Martha Stewart’s site, and this layout was done yonks ago, like 10 years or more, but it had all the info I needed to fill in the blanks. 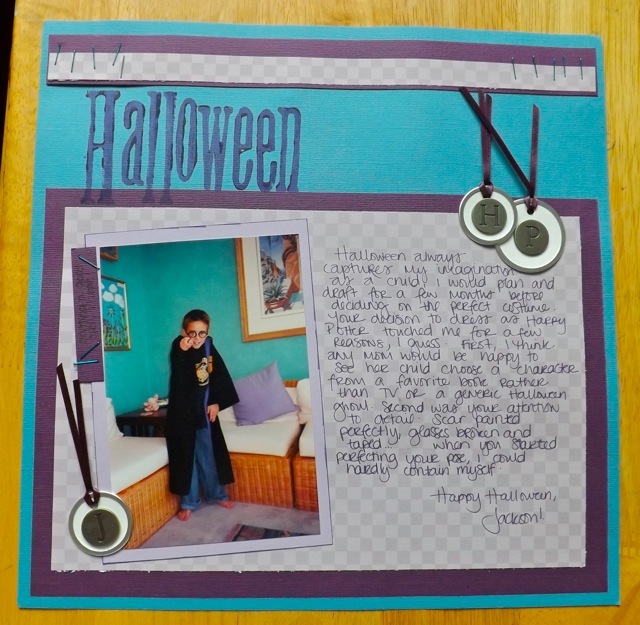 I thought it interesting that my scrapbooking had a real-world practical benefit, and it was worth mentioning, for that reason. And I still like the layout pretty well, despite it’s age, but I LOVE it for the big SCORE of getting the info quickly and painlessly. And it was Camden, NJ for my Mom and Connorsville, PA for my Dad, in case you were wondering. Only my Dad’s father (who was born in the Tyrol in Northern Italy) and my daughter, who was born in London, were not USA born and bred. 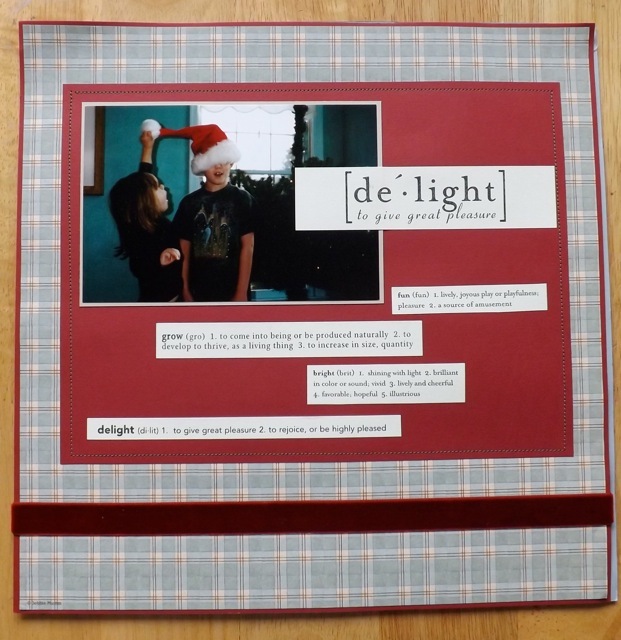 Categories: Layouts, musings | Tags: Layouts | Permalink.